For hearing impaired individuals it can be incredibly difficult to hear the phone ring or the doorbell chime which can lead to them feeling isolated and alone. Because of this, it's vital that they have technology at their disposal which can keep up with their needs. A great solution to this problem, the Visutone Ring/Doorbell Indicator for the Hard of Hearing provides hard of hearing individuals with a visual indicator that their phone or their doorbell is ringing. The Visutone listens for doorbell chimes with an included sensor cable which attaches to the doorbell's speaker. 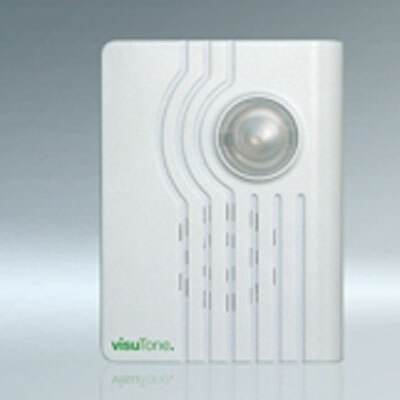 Whenever the doorbell sounds the Visutone's light will flash to alert the user. This makes it compatible with a huge range of doorbells, and eliminates the need for you to replace your existing doorbell. As well as a doorbell indicator, the Visutone can also be used as a phone ring indicator. Because it connects directly to BT phone lines, it has absolute accuracy in detecting incoming calls, and because it uses a BT landline connection it is compatible with nearly every phone on the market. The Visutone uses a bright flashing light to alert users. This gives a clear and effective indication that their phone or door requires their attention and enables them to answer either promptly, making them more active and involved. The Visutone includes a mains adapter, but can be powered by four AA batteries, giving it a great level of flexibility perfect for use both at home, in the office, on holiday or anywhere else.